The “Women’s Initiatives Supporting Group (WISG)” is a member organisation of IGLYO and a feminist organization working on women’s issues. WISG has been founded by 8 women with different proffesions on June 29, 2000. The main goal of the organization is supporting the formation of a harmonious society based on principles of social justice by empowering women, which shall ensure full involvement and equal participation in social, political, cultural and economic life for all women. The organization’s special target group includes lesbian and bisexual women, transgender persons, women representing ethnic and religious minorities, living in rural areas, with disabilities and representing other vulnerable and marginalized groups. To discover more the situation for LGBTQI people in Georgia and and WISG’s most recent publications -i.e. focusing on transgender healthcare- , we interviewed Ani Giorgadze, Communication Officer at WISG, and in the past also board member at IGLYO. 1) Ani, what is your role inside WISG? I am the Community Officer at WISG. Activities that are carried out for and by the community fall under my direct responsibility. As the staff member I joined the group in 2013. WISG used to have regular meetings of Women’s clubs and Cinema clubs (together with all the workshops and trainings and other social events alongside with it) for LBT women since 2007. In November 2013 I attended a seminar organized by TGEU in Berlin. In June 2014 we had our first Trans Group meeting at WISG. The Seminar in Berlin did not only give me an information on legal gender recognition legislations and regulations, its legal and broad social aspects in various countries and the methods and strategies that are being used by trans activists but I probably got strength and inspiration to go back and propose forming only trans space where trans people would regularly meet and organize. It took us 6 months to reach the first meeting, which was attended by 6 trans persons. Nowadays the group has 20 members. 2) What is a priority in WISG’s agenda? Community building has been the priority for WISG since 2007. Together with community building, comes the priority of safety and the measures we are constantly taking for ensuring it due to the threats we face in our context. Advocacy has been an expanding and important part of WISG’s work since 2012 and our team has to learn much as we go. In this process, it is important to receive all the information and support available to be efficient in our work. 3) Why WISG decided to research on transgender healthcare? 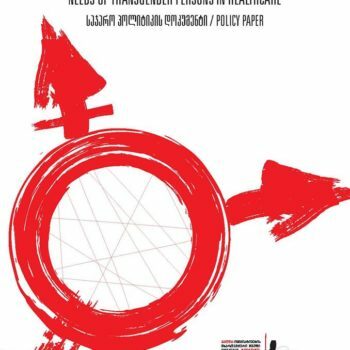 In October-November 2014 WISG conducted a study on Situation of Transgender Persons in Georgia. The aim was to research the discrimination faced by transgender persons in different spheres of life, including healthcare system and transition procedures. The results show that transphobic violence and unregulated procedures of legal gender recognition and the lack of accessibility to medical procedures, significantly affect the general well-being of our respondents. This further increases unemployment and poverty risks, facilitates marginalization of group members, and makes them vulnerable to transphobic violence. In return, stigma, unemployment and poverty risks make even more inaccessible using health services nowadays necessary for legal gender recognition. Thus, a certain vicious circle exists, escaping from which is extremely difficult. Linking legal recognition of gender, which already ignores wide spectrum of trans identities that do not fit in the binary gender system, to the process of medical transition (bringing an individual’s physical qualities in “conformity” with their gender) forms a hostile environment in which trans people have to choose between undesirable and needless medical interventions and adequate legal documents. Policy paper on Needs of Transgender Persons in Healthcare aims to evaluate the status of transgender persons in the country, identify problematic issues and develop recommendations for relevant institutions to resolve these problems. Herewith, the document does not narrow down transgender persons’ health concept only to medical procedures required for transition. Issues related to transgender persons’ health includes a wider spectrum of services and resources necessary for a healthy life in a safe society. This includes primary and other care services, as well as socio-economic determinants of health like the policy of legal recognition of gender, poverty, unemployment, homelessness, and receptiveness from the public. A priority task of the present public policy document is to delimit legal recognition of gender and trans-specific medical services in a manner that would achieve maximum compliance with human rights standards in view of the country’s context; and further, to make initial steps for ensuring transgender people’s access to highest attainable standards of health. 4) How is the situation in Georgia for LGBTQI people? Frustrating and troublesome. The gap between the legal framework and de-facto situation of LGBTQI persons has been increasing over past years making the situation even more dangerous. LGBTQI people have most of the fundamental rights recognized by the state, legally, on the papers, but in practice, people have not been given a chance to practice their rights. There is a danger of giving the society a message saying that one will get by with attacking queers, will get by with killing trans people. The latest court decisions regarding the case of May 17, 2013 where the court found people accused of attacking LGBTQI people on May 17 innocent and the murder of trans Woman in November 2014 where the man accused of murder has not been found guilty leaves us again at a higher risk of violence and are alarming developments in here. For a more extensive overview, one can read through WISG’s latest Study on Discrimination and Hate Crime Against LGBT Persons and the Policy paper on Legal Situation of LGBT People in Georgia. 5) Who would you suggest to read these publications? I’d suggest to read these publications to anyone who cares. To anyone who cares and is enraged by the injustices and stands up next to marginalized groups in the fight for being happy and safe! Would you like to get more information on WISG’s work? Cover pictures of WISG’s publications on transgender healthcare in Georgia.